Regardless if weather permits, we are quickly approaching the spring and summer seasons of countless beer gardens, pop-up bars, and fights for the public hammocks in Philadelphia. 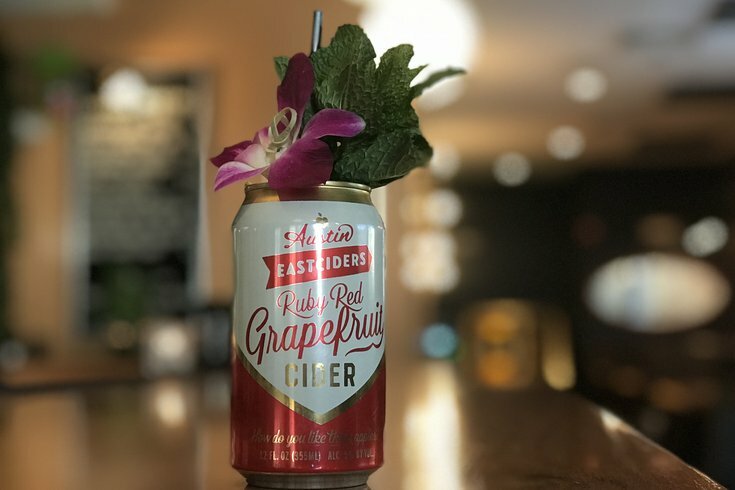 Among the first pop-ups of the season is Burg’s Hideaway Lounge, the year-round Point Breeze tiki bar that’s welcoming warmer weather this week – whether it’s actually here or not – with some new seasonal drinks, brand new outdoor seating, and a pop-up partnership with Austin Eastciders. Thursday, April 5, from 5 p.m. to 7 p.m., Burg’s will debut its new mainstay drink option, the flowery, minty tequila-and-cider infused Grapefruit Paloma, alongside two other canned cider-based tiki cocktails: the Mai Tai on the Fly (pineapple, rum, and amaretto) and Sayonara Punch (blood orange and sake). Burg’s will also debut some new Polynesian-inspired dishes Thursday, including kimchi mushroom dumplings and miso salmon.